CLEVELAND, Va. — Clinch River Plant collected and delivered gifts for 14 children last week as part of the Southwest Virginia Childrens Star Christmas Project, and three more through the Salvation Army. In addition, plant employees donated 50 pairs of gloves and hats for a local middle school drive. 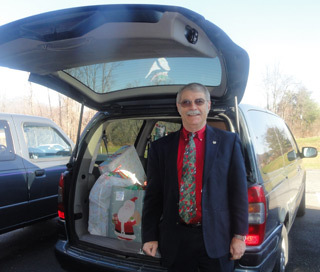 Larry Rasnake, principal of Cleveland Elementary School, stands in front of the "sleigh" filled with items for children. The minivan made two trips to deliver the gifts to area children. Clinch River has been part of the Star program since its inception in 2008, but has been working in similar fashion with local schools and communities since the 1970s. Through the Star program, every child receives a coat, hat, mittens, shirt, pants, shoes, and a gift stocking complete with stuffers, and toys in which they have expressed interest. Even though the plant continues to decrease in numbers, plant employees and contractors (D&Z, Prime and Brand), and Jimmy Whitson, a former contract worker, continue to generously support this project through donations. Organizers say they have never had to decrease the number of children requested each year. In fact, the number of children grows from the original request. And at the last minute, an emergency call came in for several more children from the Salvation Army, and Clinch River employees answered by providing clothing and toys for the additional children. Larry Rasnake, principal of Cleveland Elementary School, expressed his gratitude for the efforts of Clinch River Plant employees and contractors. “We can’t say ‘thank you’ enough for Clinch River’s generosity and giving attitude,” he said.